Castle in the Clouds refers to the mountaintop Lucknow Estate in New Hampshire's Lakes Region, high in the Ossipee Mountain Range. 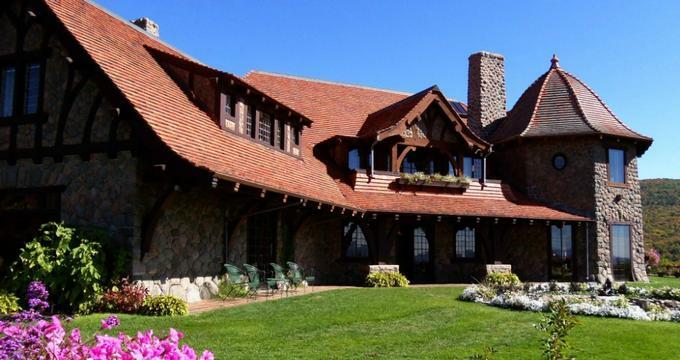 The mansion is an Arts and Crafts style home built in 1914, currently outfitted as a museum with period furnishing, electrical systems, and even vintage clothing in the closets. An art gallery in the mansion’s carriage house hosts rotating exhibits by local artists. The Carriage House Restaurant is open for lunch and dinner, and Carriage Cones, an ice cream shop, is open seasonally all afternoon. The Lucknow Estate was built between 1913 and 1914 and was the home of Tom and Olive Plant. The home, designed by J. Williams Beal & Sons of Boston is an example of Craftsman style architecture, which embraced a design philosophy of building in harmony with nature. Balancing the natural aesthetic is the home’s incorporation of the early 20th century’s newest technologies. The house includes a central vacuum system, a circular shower and interlocking kitchen tiles. The mansion features Tiffany stained glass, as well as intricate bronze, wood and tile detailing. In addition to the 16-room mansion, Plant built a carriage house, greenhouse, gatehouses and stables. Activities on the expansive grounds include horseback riding. Guests enjoy guided trail rides through the historic wooded acreage year round. Trails offer views of Lake Winnipesaukee and the small waterfalls along Shannon Brook. The one-hour rides are suitable for all levels of horseback riders, as they are walking-only. Horse-drawn carriage rides are available during the summer months, while sleigh rides take place during winter. Younger visitors may enjoy 10-minute pony rides through the fields to Shannon Brook and back. The same trails may be explored on foot. 28 miles of hiking trails have been established and maintained by the Lakes Region Conservation Trust throughout the 5,200-acre area. Popular hikes include the hike to Falls of Song, the area’s largest waterfall, or the more strenuous hikes to the Ossipee Mountains, which offer striking views of New Hampshire’s Lakes Region. Shannon Pond, just off the exit road is stocked in the summers with rainbow trout. Visitors enjoy watching the trout jump from the water or may purchase food to feed them. Most of the property is open for casually exploring. Guests are encouraged to bring food, make use of the picnic tables throughout and enjoy a full day on site. History: Thomas Plant made his fortune in the shoe manufacturing industry and retired at the age of 51, having sold his company. Three years later, the newly married millionaire began to purchase property in the Ossipee Mountains to build his estate. He eventually acquired over 6,000 acres bordering Lake Winnipesaukee. During the Great Depression, Plant lost much of his wealth due to a series of poor investments. He was unable to sell the estate to pay back his creditors. Consequently, much of the homes content’s were auctioned off, save for the furniture, in 1941, although the Plants were allowed to live in the home until Tom’s death later that same year. The families who subsequently owned the property preserved the integrity of the mansion and kept it very near its original state. It first opened to the public as a museum in 1956. The non-profit Castle Preservation Society purchased the property in 2002. While the Society assumes full management and restoration responsibilities for the historic buildings, the Lakes Region Conservation Trust manages the 5,200 remaining acres and the trail system throughout. Ongoing Programs and Education: Inside the mansion, activities are available to help children learn about life in the 1920’s. Kids can explore and play with kitchen gadgets, writing letters in the guest room, or feeding the fish in the mansion’s pond. Hiking events are frequently included on the calendar, such as monthly full moon group hikes, dog walking groups, and even mushroom forays. During the summer months, Tuesday and Thursday nights are Music Nights with open air live music available on the lawn. Wellness Wednesdays offers yoga classes while open-air landscape painting workshops take place on Fridays. During the winter months, the mansion is decorated for the holidays. Christmas at the Castle, a specially themed tour, is one of the most popular annual events. Past and Future Exhibits: The Carriage House Art Gallery’s current show is ‘Finding Place on Paper: Contemporary Poets and Printmakers Explore the Lakes Region and White Mountains.’ The multimedia show features area artists and explores their personal connections to some of New Hampshire’s most iconic monuments and landscapes.